Malea has discovered she some of the advantages that come with being a younger sister! Today I took the girls on a bike ride. We were all hot when we got back so I got Kaidrei and I a otter pop and we were going to sit on the porch swing in the shade. I had Malea on my lap holding her and my Popsicle on my left side. I turned to help Kaidrei up onto the swing on my right side and I felt Malea squirming like crazy. After I got Kaidrei up on the swing I turned back to see Malea contentedly eat my Popsicle! I took it away and I don't think I've ever seen such an extreme reaction of pure outrage from this little one before. 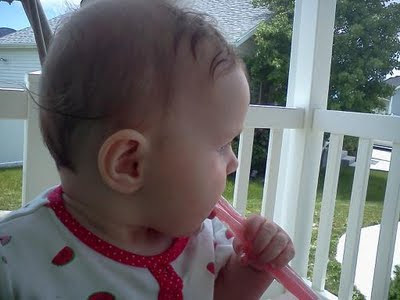 So I relented, we shared the Popsicle, and this little girl enjoy the pleasures of a summer Popsicle on a hot day a lot earlier than I'd planned on!